Badlesmere church has a peaceful setting among fields and close to a farmyard half a mile off the A251. 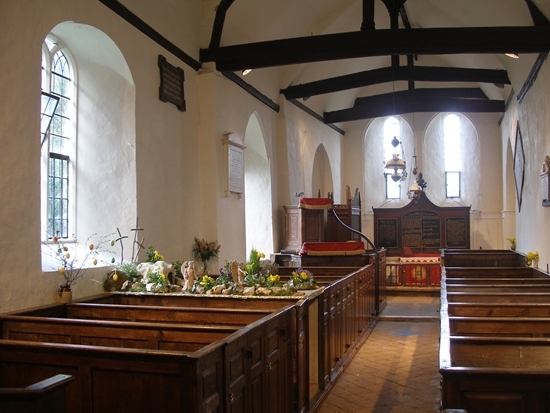 It is well known for its unaltered 18th Century interior, including box pews, highly praised by John Betjeman. It has medieval origins and in 2014, crown posts which had been hidden for about 300 years were discovered. The standard services are: 2nd Sunday in the month 9.30 am BCP Communion (said) and 4th Sunday in the month 6.30 pm BCP Evensong and shortened Holy Communion. The candlelit carol service on Christmas Eve is packed every year, and an Animal Blessing Service is held on Badlesmere Lees every year.